We're delighted and honoured to be nominated for Community Group of the Year at the PinkNews Awards. The annual PinkNews Awards celebrate the contributions of UK politicians, businesses and community groups in upholding and promoting LGBT rights and equality. Winners will be decided by a public vote. Vote for the Kaleidoscope Trust now! The awards will be announced at an event held at the Houses of Parliament at the end of October and introduced by the Speaker of the House of Commons, John Bercow. Presenters of the awards will include First Secretary of State and leader of the House of Commons William Hague, Business Secretary Vince Cable and Shadow Chancellor Ed Balls. The Kaleidoscope Trust has been nominated for an award in the Community Group category alongside four other organisations, including our friends at the Human Dignity Trust and The Equality Network, Scotland. The vote will close at 12pm on Monday 20 October. 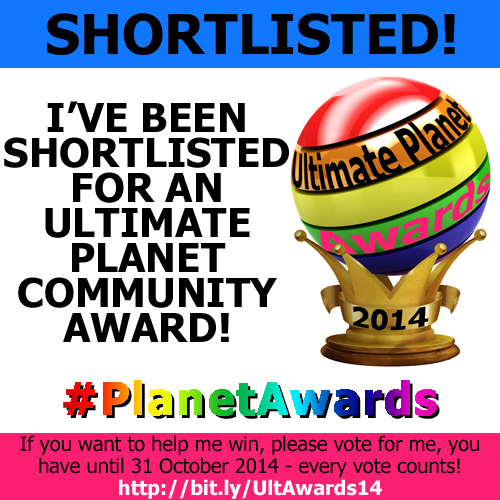 We're also proud to be nominated for an Ultimate Planet Award in the Charity of the Year category. The Ultimate Planet Awards, part of the lesbian lifestyle and listings portal Planet London, celebrate everyone who works hard for the lesbian, bi & queer women's community in London, Brighton and further afield. Cast your vote here! Voting is open until the end of October, and the Awards will be held on 2 November. Tickets to the awards ceremony and after-party are available here.